A popular Australian cave has translated their tour to the pointless Star Trek language Klingon. I admire people for the effort it takes to learn a new language, but is it really necessary to have tours using it? Will the Louvre French museum have a tour in Avatar Na'vi? Will we be able to enjoy Arizona's Grand Canyon listening in Clockwork Orange's Nadsat? The population that can actually speak and understand Klingon could fit in a medium-sized airplane. This is more a publicity stunt than anything else. We are poised to boldly go where no other tourist attraction has gone before, with the first cave tour in the world to be available in the Klingon language. In the Star Trek universe, Jenolan Caves was first immortalized in the Next Generation episode ‘Relics’, through the naming of a ‘Sydney Class’ Starship - the USS Jenolan. Now, this relationship will be developed further, when Jenolan Caves adds the language of Star Trek’s great warrior race to a tour of their most popular cave. Opened on Stardate 60358.1 (December 2006) Jenolan Caves’ Self-Guided tour takes visitors through “The Nettle Cave”, and is seen by 150,000 - 200,000 visitors annually, making it the most visited cave in Australia. Visitors take the tour with a digital audio device, provided by ‘Acoustiguide of Australia’. The tour is currently available in 8 languages. However, as of August 22, it will be available in 11 languages, one of which will be Klingon – the first genuine tour available on Planet Earth for Klingon speakers. Early July saw Klingon scholars, Michael Roney Jr (aka naHQun) and Tracy Canfield, fly in from the USA, to finalise the translation and record the Klingon audio tour in a Sydney studio. Tracy and naHQun experienced the amazing Nettle Cave first hand, with naHQun exclaiming, “lH, qar’a’”? (For Terrans, he was remarking on the beauty of the cave). In Sydney, on August 22nd, to launch the tour to Star Trek devotees, Jenolan Caves staff will attend OzTrek3. 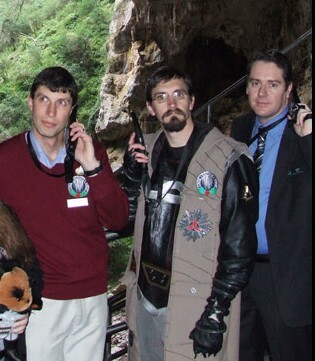 The self-guided tour with Klingon commentary will then be available to all Jenolan Caves visitors. Would you take the self-guided tour in Klingon? [Would] SoH tlhap [the] [self-guided] [tour] Daq tlhIngan?